Are you ready to take your relaxation activities to the next level? If you are, then you might need to get yourself an inflatable hot tub with seats today! I am sure that you are quite familiar with this tubs. But if not, then this guide is here to help you! I have included all the necessary things and details that you may need to know about these blow-up hot tubs. So sit back, relax, and keep on reading. You might just find the exact thing that you needed most during your stressful days. All of the inflatable whirlpools with seats listed here in this guide are the ones that I find really great and appealing. Also, these are perfect for any homeowners who want a decent inflatable spa seat at home. 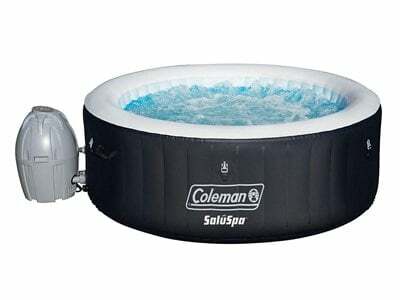 The Coleman Saluspa Portable Spa Inflatable is very easy to set up and convenient to move around. In comparison to most inflatables today, this one is very lightweight even if it is filled with water. Also, the two handles on its side make it very easy to transport. It has the capacity to hold up to 4 persons with 210 gallons of water in it. As for the durability, it uses a 3-ply PVC and an I-beam which allows the users to seat on the walls. Also, users need not worry about its maintenance as the package comes with 2 replaceable filter cartridges, a chemical floater, and an inflatable cover. 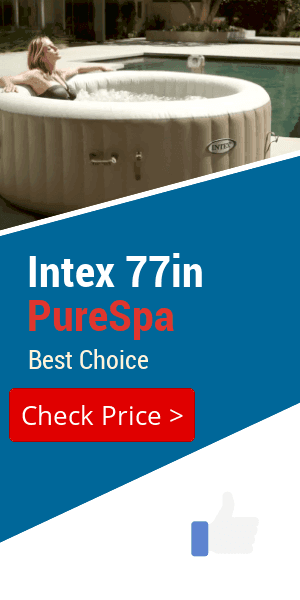 If you are looking for an Intex Spa that is cost-effective and functional, the Intex PureSpa Massage Spa might be the one for you. 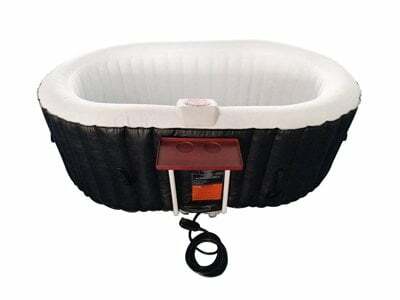 This hot tub is very portable as it features handles on its sides and it comes with a carry bag for easy transportation. Also, this is very inexpensive considering all the maintenance features that it provides. It is actually equipped with a built-in hard water treatment, anti-calcium build-up, and Suspended-Crystal Filter Cartridges. Moreover, it comes with a 3-way test strip, chemical floater, thermal ground cloth, and inflation hose. The Comfort Line Products Spa-N-A-Box Portable Spa is very easy to set up. In fact, this reason alone is why I included this product in my list of today’s blow-up Jacuzzis with seats. It would only take you 15 to 30 minutes to accomplish the whole process and that is quite an advantage for the product. However, the design is not really great. Although the idea and concept are great, it is just not properly executed in the manufacturing. I would love it if this product will be improved later on. Also, it’s quite noisy when the air jets are running. 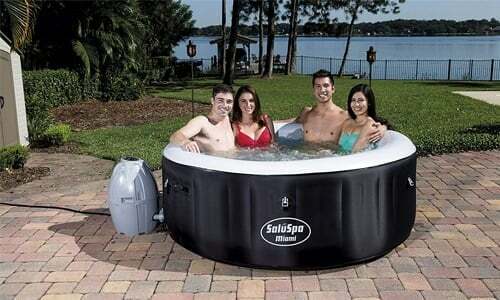 The ALEKO Oval Spa is perfect for homeowners who want a small blow-up hot tub. It is very portable and compact. Also, it is easy to use and quite easy to maintain. And since it’s not that huge, it can heat the water in just within 3 hours. However, this one is nothing like the Intex hot tub seats. You cannot really sit on its walls as it is not very sturdy. Also, it is quite expensive considering the quality and features that it can provide. The Bestway SaluSpa Miami Air Jet is a go-to of today. Aside from affordability, it actually provides decent features that any user would enjoy. Although the water capacity is quite small, it can still provide enough space for 2 to 4 persons. Also, the digital control panel is very convenient to use. It features a rapid heating technology that is pretty useful if you ever think of having a relaxing moment immediately. 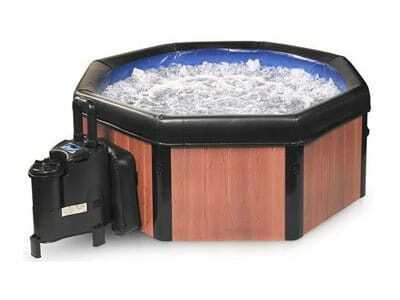 The most inexpensive Jacuzzi in this list is the Goplus Outdoor Spa. Aside from its affordability, the thing that makes this hot tub great is that is an all-inclusive package. It is very durable and sturdy. Also, it is quite spacious for 4 persons which is a great advantage for the product. Moreover, you no longer need to worry about the maintenance because it has an effective built-in hard water treatment and filter cartridge. But while the SaluSpa Siena Air Jet with seats is quite expensive, it is actually one of the most popular hot tubs of today. Its unique oval shape and structure is mainly the reason why. And if you are looking for a Lay Z Spa-type of a hot tub, this might be the one for you. Apparently, it can fit up to 1 person on each section of it. Also, it comes with a single table accessory that can be used as a cup and book holder. The materials used in its construction are very sturdy, durable, and yet comfortable. 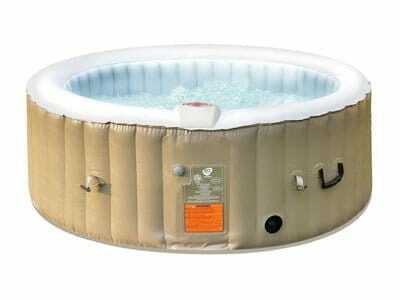 The Bestway Hawaii Air Jet Inflatable Outdoor Spa is one of the newest models of Bestway. And apparently, many are actually loving this model since it is very functional, durable, and sturdy. In addition, the system features an electrical and power-saving technology which is very efficient. 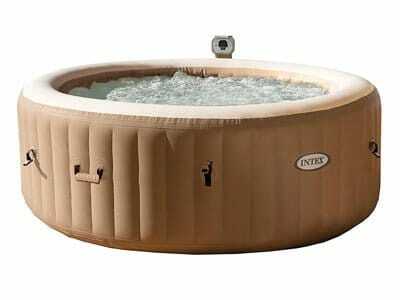 In fact, a lot of Bestway Inflatable Hot Tub users highly recommends this model over than its predecessors. However, the main drawback of this product is that it does not have a drain tube. And this makes it quite tricky on how to drain the tub after using it. Things like these are very common for owners to say, especially when they got the wrong and unfitting inflatable hot tub with seating. And surely, you don’t want to end up saying things like these as well once you unwrap the package, right? So, in order for you to avoid this, you must consider all the factors that may affect the quality of the product and your buying decisions. One of the primary things that you need to consider is if the spa includes seats. Apparently, this is a very common mistake that most first-time buyers do when buying their chosen inflatable spa seat hot tub. They tend to take the seat as a literal built-in seat included in the hot tub. Keep in mind that an inflatable hot tub with built-in seats is very hard to come by. In fact, most brands and companies today would take seats as a separate purchase. Most of the time, the hot tub seat cushions are not literally built-in seats. They are simply the cushioned bottom where users could sit and make themselves comfortable. So, be very careful in using these terms as it may confuse you in making your purchase. Another important factor you need to consider when choosing your inflatable hot tub with chairs is the system that it uses. Today, there are only two types - hydro jets and air jets. Keep in mind that these jets are the responsible ones for the relaxing sensation that you will get to experience. When you are choosing air jets (which apparently is the most common type), you will get to experience a much simpler relaxing sensation. It provides enough bubbles and massaging methods for the users. Also, they are very inexpensive. On the other hand, if you want a personalized and customized type of bubble massage, then the hydro jets are the way to go. 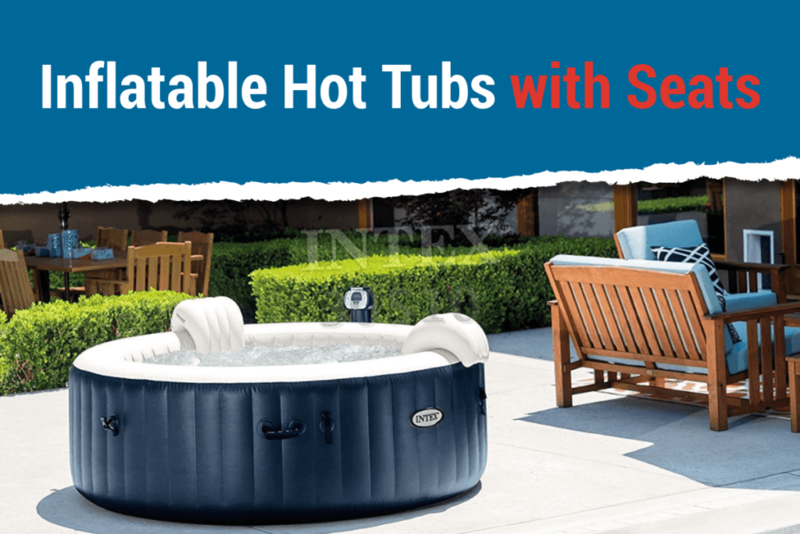 But, they are quite expensive since it comes with a lot of additional features to support the customization and personalization of your hot tub experience. When buying an inflatable hot tub with seats, the size, capacity, and volume of the tubs are very important things to consider. For the size, make sure that your chosen product will fit in your property. This is very essential, especially for owners and users who want to set up the hot tub in a small space. 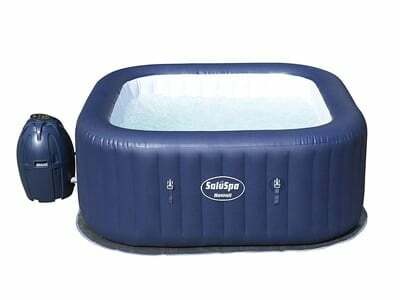 As for the capacity, ensure that you know first how many people the inflatable spa can carry. Most of the time, people tend to forget this which usually results in inconvenience for both buyer and seller. In addition to these things, volume or water capacity is also another factor to consider. Learning this will help you know how much water you will need and how much it would weigh once the tub is filled to the brim. The features and functionalities of your chosen tub will play a huge role in the overall cost of the package. So, be sure to check and regard these things, especially when cost and budget are your number one factors to consider. Normally, a basic inflatable hot tub would include a simple digital control panel, spa seat flooring, and massage spa options. 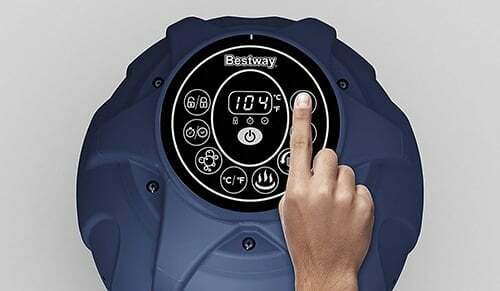 As for the high-end types of inflatable spas, you could expect much smarter features and functionalities like maximum temperature detection, hot tub booster seat, and hard water treatment. Maintenance is an important factor to consider if you really want to buy a blow-up spa. Well, there is no such thing as a self-cleaning inflatable spa. And I know that you know this for a fact. But, most buyers tend to disregard this factor as they make their purchase only to find out that it would cost them so much more because of the maintenance. So, before heading out to make your purchase, make sure to ask first all of the things that would involve the maintenance of the chosen hot tub. All of the inflatable spas listed in here are quite great and decent. 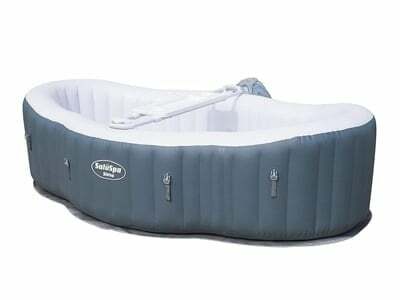 But, the SaluSpa Siena AirJet Inflatable Hot Tub stands out the most among the rest. 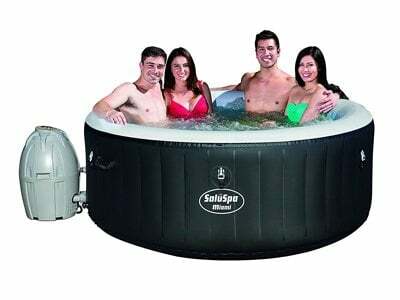 Primarily, it is the most unique type of inflatable hot tub since it is very similar to the traditional bathtubs. Secondly, it is equipped with many smart features and functions that are really helpful to users. And lastly, it is easy to set up and the heater is very effective. But, it is not to say that this is the perfect inflatable hot tub for you. It could be but your preference is the one that matters. So, keep in mind that this is only a guide that may help you in making your buying decisions. Copyright © 2019 LintonsInTheGarden.com. Unauthorized use and/or duplication of this material without express and written permission from this blog’s author and/or owner is strictly prohibited. Excerpts and links may be used, provided that full and clear credit is given to LintonsInTheGarden.com with appropriate and specific direction to the original content. LintonsInTheGarden.com participates in the Amazon Services LLC Associates Program, an affiliate advertising program designed to provide a means for sites to earn advertising fees by advertising and linking to Amazon.com. Amazon and the Amazon logo are trademarks of Amazon.com, Inc. or its affiliates.